There is something about the short but powerful novel that I love. I look forward to immersing myself in an emotional and thought-provoking world, one that hits you with a wallop of depth in just a few sittings. These books often have the ability to stay with me more than the longest of epics. 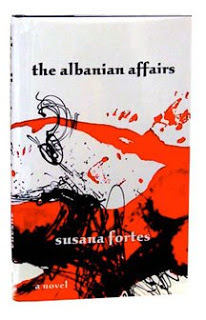 The Albanian Affairs by Susana Fortes is just this sort of novel. Originally published in Spanish as El amante albanes, and now translated by Leland H. Chambers by McPherson & Company (an indie press with a fantastic catalog), The Albanian Affairs manages to offer lust, love, political history, and family intrigue all in a mere 180 pages. The story takes place in an Albanian villa full of family secrets. Ismail, the youngest son, is growing more and more curious over the death of his Spanish mother when he was only a boy. He also finds himself tormented by the presence of his older brother’s new wife, the first woman to reside in their family in many years. He and Helena find themselves drawn to each other – too much. At the same time he struggles against his growing feelings for his brother’s wife, he begins to unravel his mother’s story. The Albanian Affairs is a passionate work that is painted rather than written. The language is stunning leaving me to marvel at the translation, and the backdrop of an Albania under the dictatorship of Enver Hoxha makes for a dark and moving novel. As for McPherson & Company, there are a few publishers out there that make me drool over their book list like a kid with a department store Christmas catalog. This is one of them. If you love translated works and unique literature as much as I do, you learn to follow the indie publishers as much as your favorite authors, and McPherson & Company is one I like to keep my eye on. Read the first two chapters of The Albanian Affairs online. ????????? ?, ??? ???????? ? ???? ? ? ? ? ? ?? great article and very fluently delivered. hope to read more blogs that you write. I am also interested on book reading.